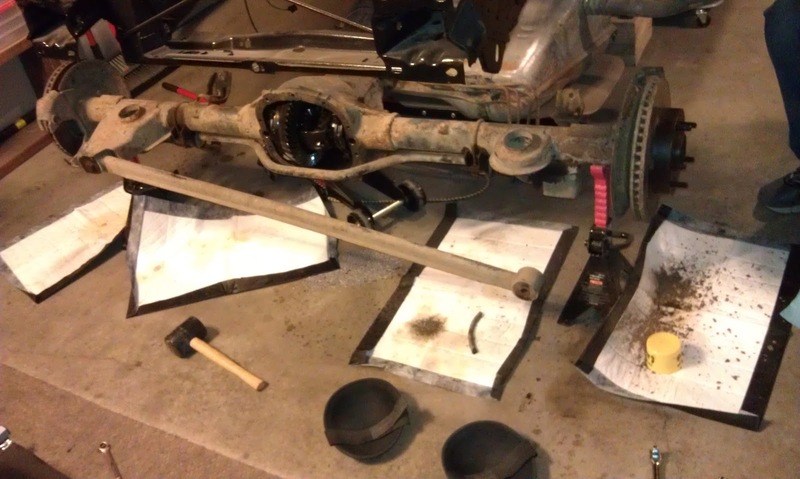 I started by removing the caliper bolts on the driver side caliper using the same socket I bought for the front. 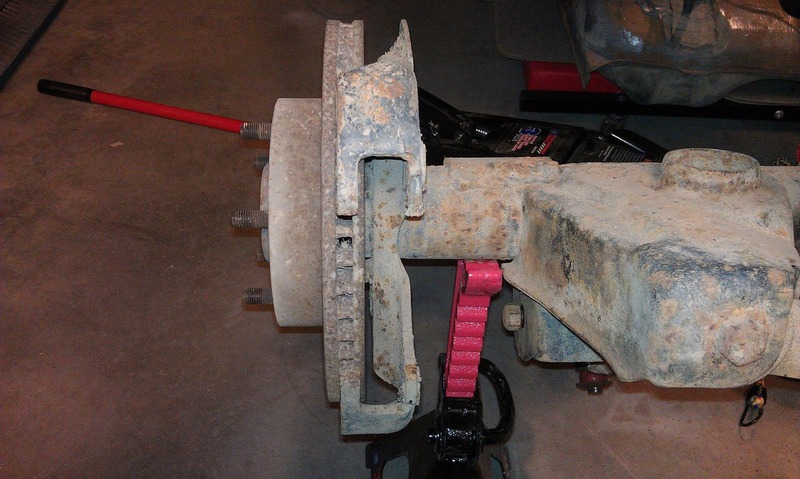 I had already removed the parking brake assembly before we lowered the rear end, so once the bolts were removed the caliper slid right off. 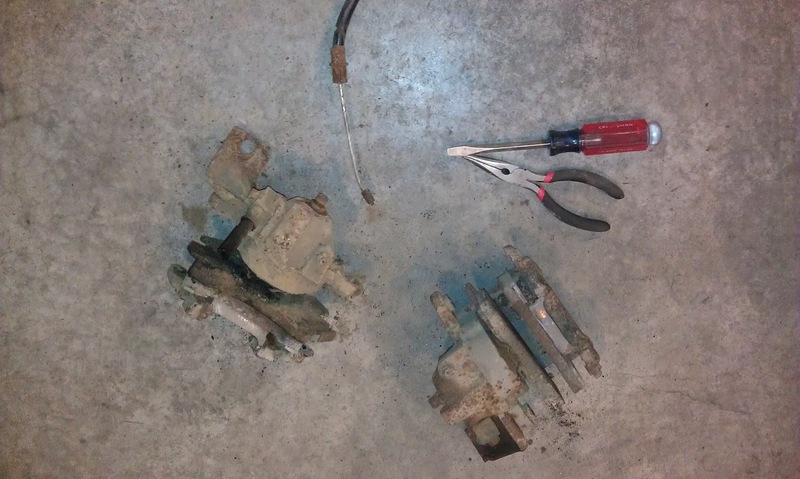 The driver side caliper has been removed. Sara's dad came over to help me. 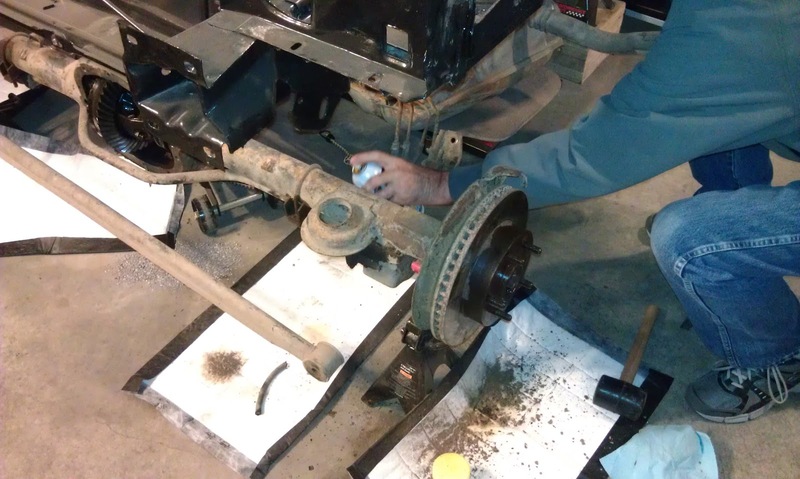 He started by working on loosening the caliper bolts on the passenger side while I worked to remove the parking brake assembly. 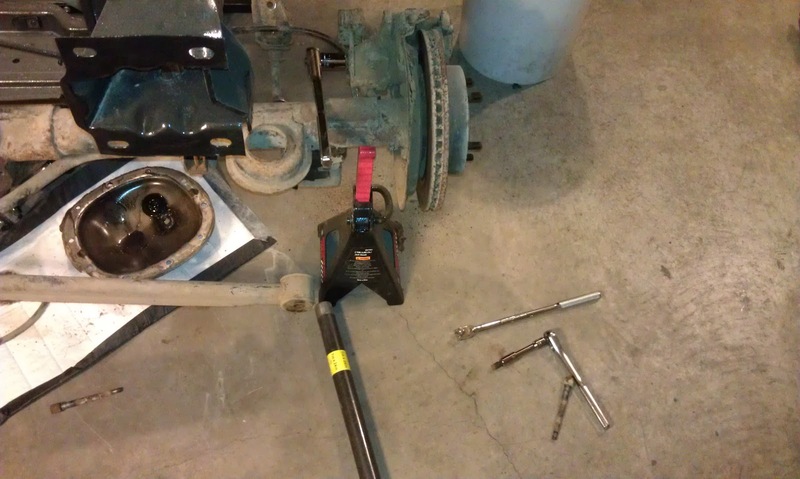 The nut on the parking brake assembly was seized and I ended up using the cheater bar to break it loose. 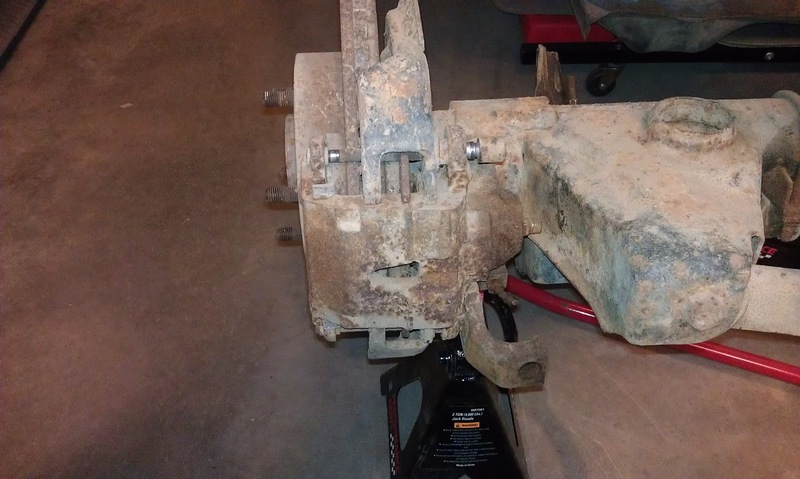 The passenger side caliper was somewhat rusted to the rotor and caliper mount, but a few taps with the rubber hammer loosened it right up. 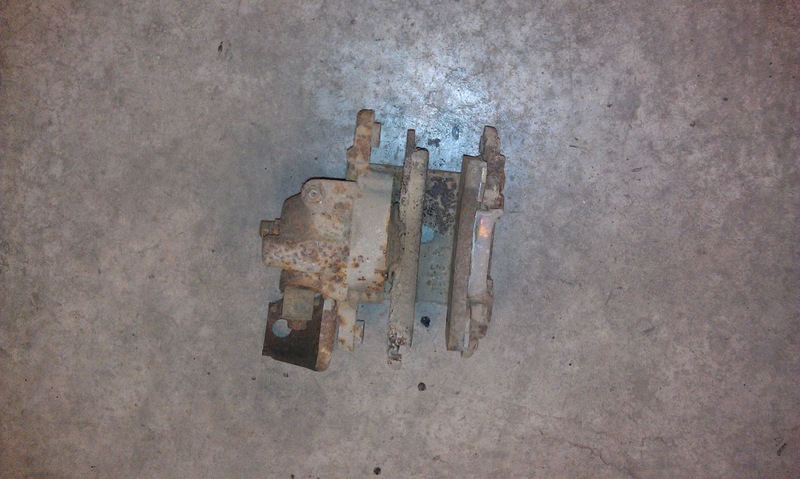 Here are both the driver side and passenger side calipers. 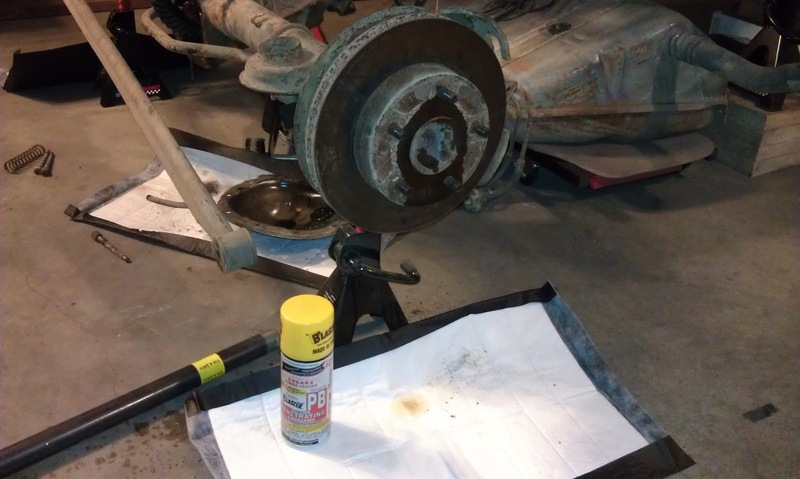 The rear rotors were rusted solid to the axle. I read online that we needed to spray them with a penetrant and let it soak in. 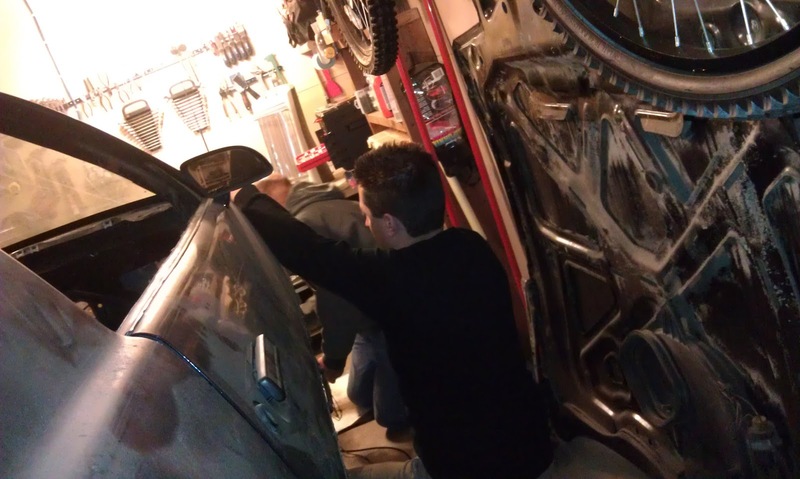 We sprayed both rotors with PB Blaster and then went to dinner with Sara. 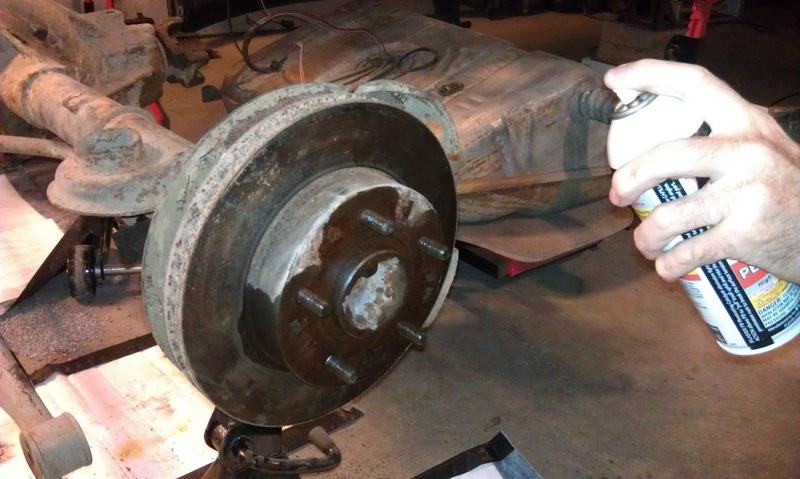 When we got back the rotors were still very much seized. 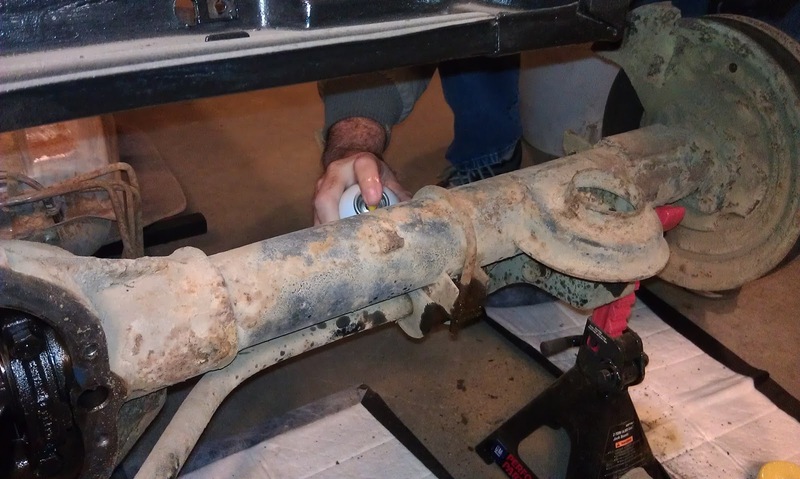 We sprayed all the points again with PB Blaster and then also sprayed some of the bolts for the sway bar bushing brackets and for the Panhard/track bar. 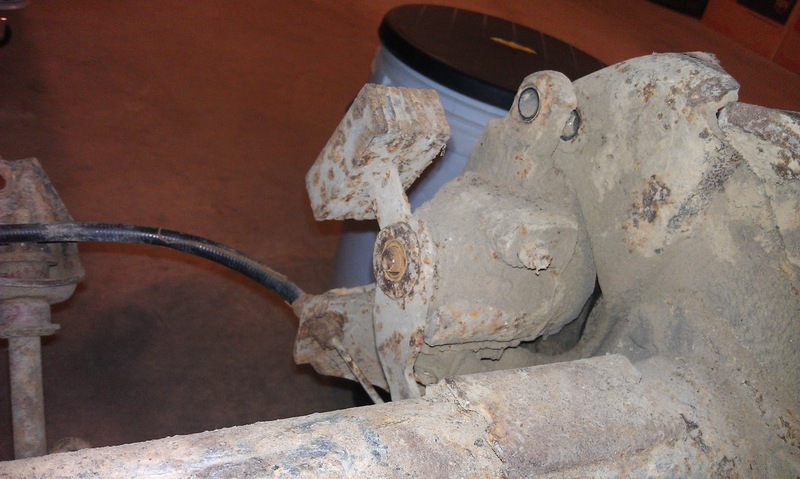 This is a picture of the sway bar bushing bolts that we sprayed. 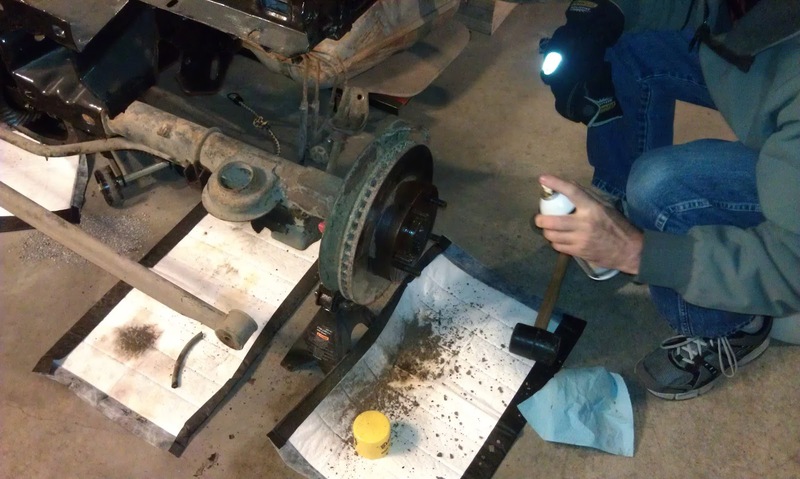 Here are pictures of Sara's dad spraying the rotors for the third time. 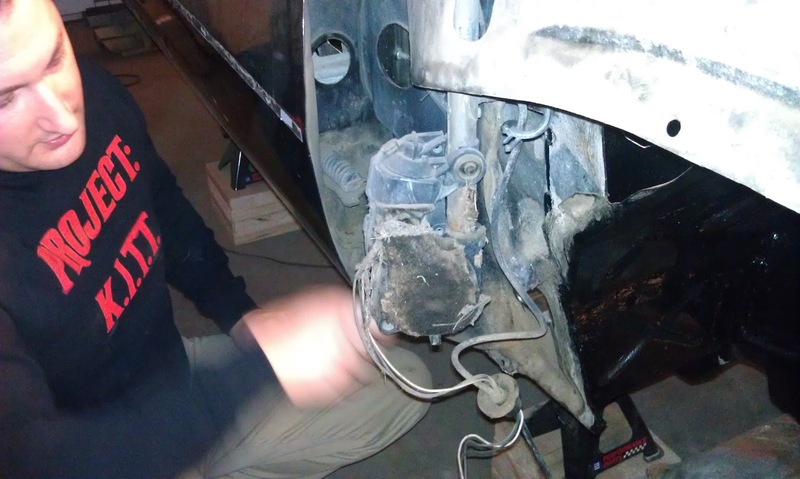 He sprayed the sway bar bushing mounts again as well. 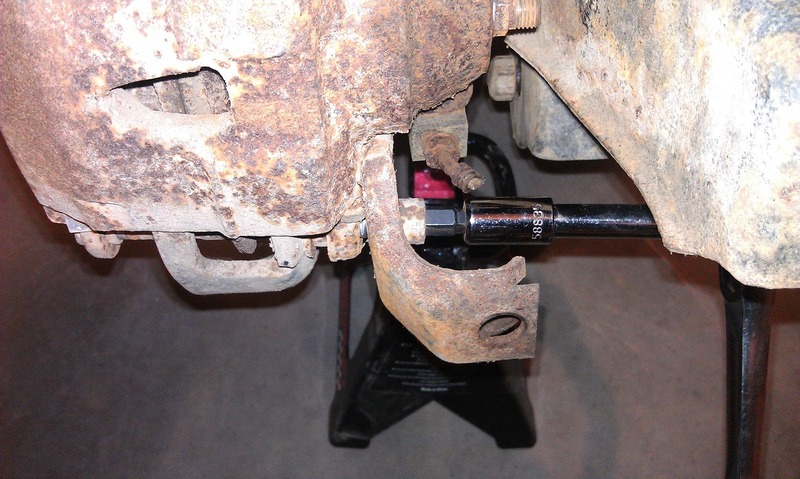 I tried loosening the nuts on the sway bar bushing but they would not budge. We laid Oil Zap pads down to catch any excess penetrant. 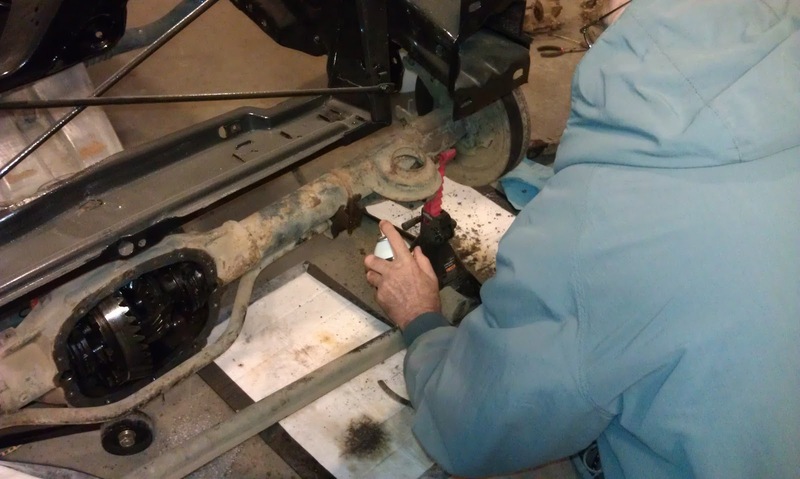 Sara's dad is examining the cut off bolt in the Panhard/track bar brace. I am going to see if Troy can get it out because I cannot. Spraying one more time. Everything is still very much seized. We are going to let it sit overnight and see if that helps loosen things up. 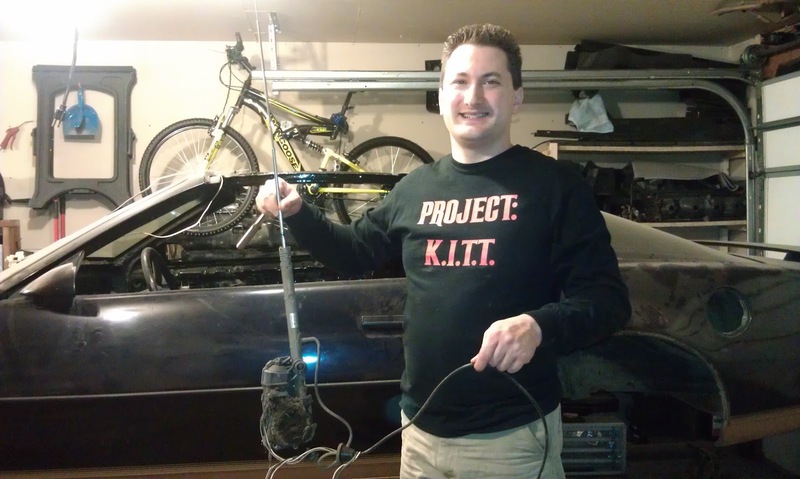 I decided to remove the power antenna before we called it a night. 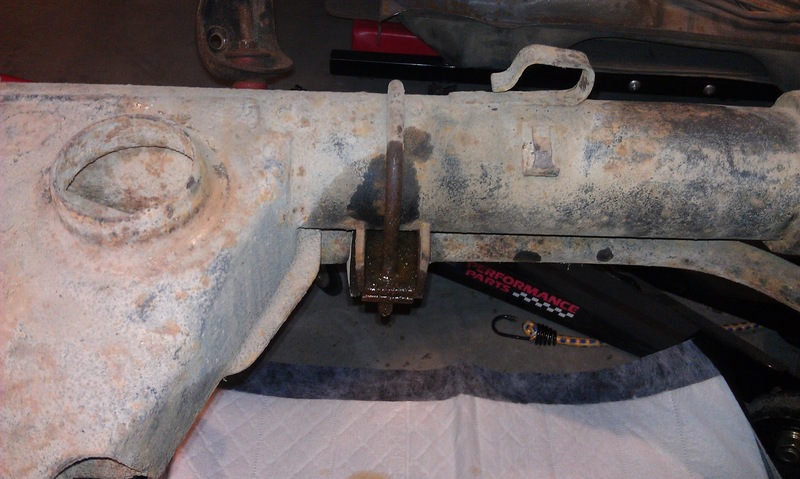 One bolt on the bracket freed it from the frame of the car. 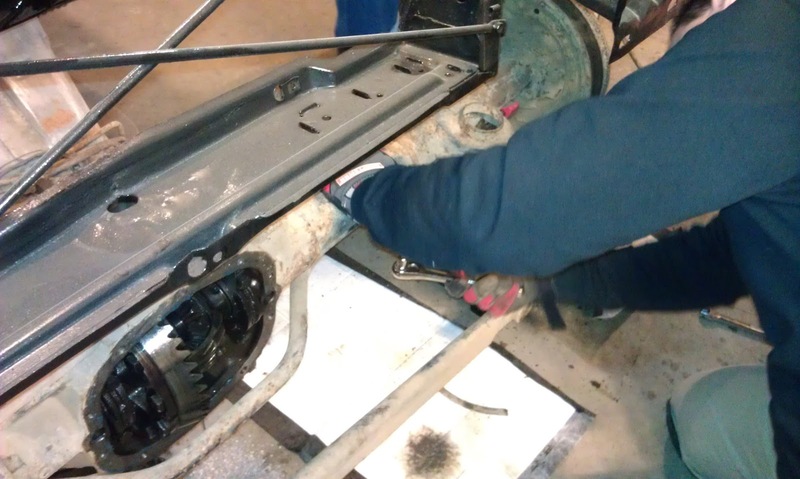 Once the bolt was out I just had to lower the antenna mast and motor through the hole in the frame. Here is the power antenna assembly. 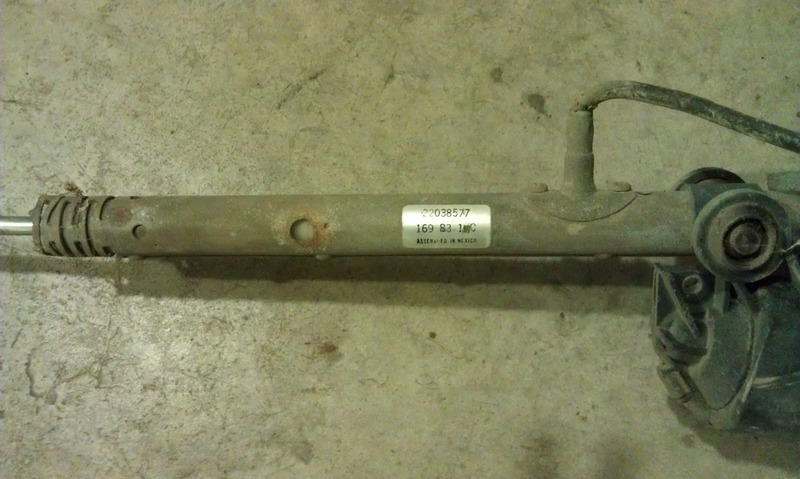 The tag on the power antenna says "Made in Mexico". 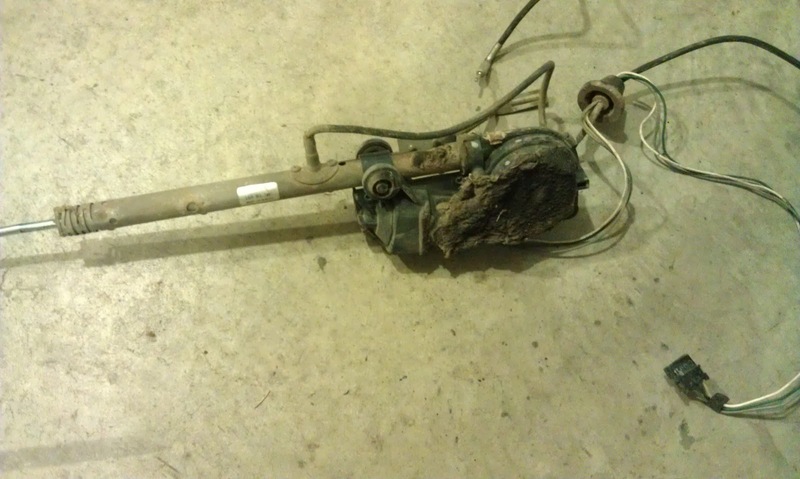 The power motor assembly had a lot of dirt and dead leaves stuck in it. Sara's dad pulled out what he could. 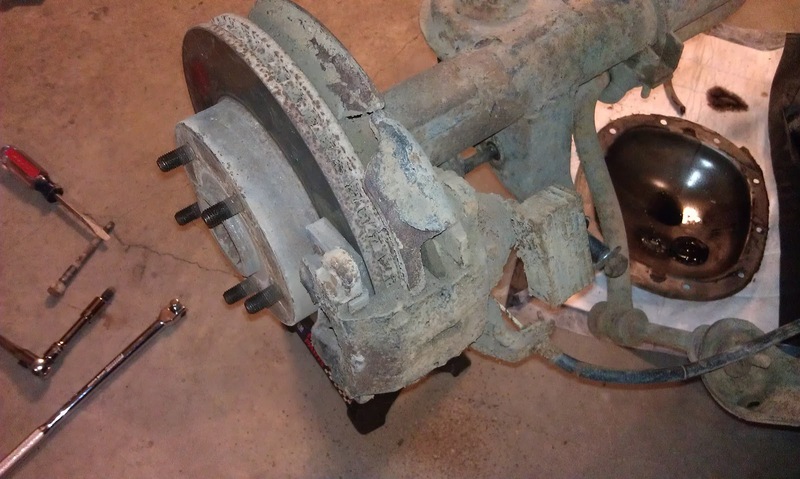 After work today I attempted to pull the rotors off. Even using Troy's suggestion of beating on it with a hammer did not help. 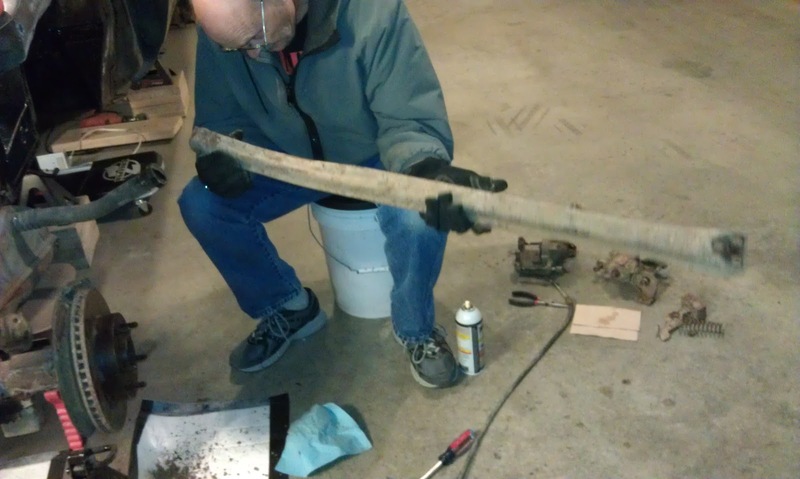 Troy is going to bring over the air chisel to see if we can get it to loosen the rust up around the studs. My order for the Fuel Tank Repair Kit arrived today also.